Angry Birds Star Wars will be released on November 8th, but today we get our first view of actual gameplay. The game plays like the standard Angry Birds, but with a Star Wars-themed twist. The video shows birds using the Force and wielding a light saber to smash the Darkside-using Pigs. 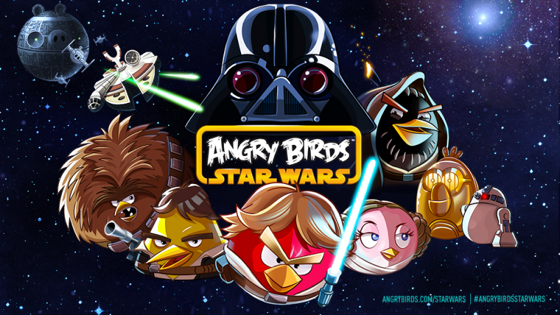 Typical for Rovio games, Angry Birds Star Wars will be available for iOS and Mac. My 10-year-old is going to plotz. He just managed to save up half the cost of an iPod Touch, so we're buying it for him tonight. Just in time for this. I wait for Angry Birds Star Trek with assimilated piggies. It's not so much that they'll be forced to buy this game as other games will be pushed off of the charts, and so, for all intents and purposes, no longer be available on the app store. As Rovio continues to release these expansions and bill them as new apps, they'll continue to clutter the top charts until there aren't other games available on the app store. so you are upset that they keep making games people want to buy? I'm looking forward to reading more of the insightful views about how rather than being a cheap and fun game for fans of both Angry Birds and Star Wars, this actually a cyncial way to make money from either/both Rovio and/or George Lucas (ignoring the fact Lucas has retired and so isn't personally responsible in any way). I'll be particularly pleased if someone can explain how anyone will be forced (no pun intended) to buy the game, or why it's a terrible thing to bring people a game that will be enjoyed in a world full of bad games that are no fun but cost much more money. I've spent just over £2 in total on Angry Birds, Angry Birds Seasons, and Angry Birds Space and have had countless hours of entertainment on my daily commute for that money, as well as loads of new levels added completely free of charge. And to make things even better, due to account sharing in iTunes, my wife has also enjoyed exactly the same completely free. In fact, the Angry Birds games may well be the best value for money purchase that we have ever made all things considered, and yet people still complain about them! Very strange. Wow, now they are really cashing out. I wonder how many games they can get away with? Another Angry Birds cash cow, ready to be milked. How much milk is left in this cow?